Stella Arnaldo's Blogspot: Help build DOT's web site! 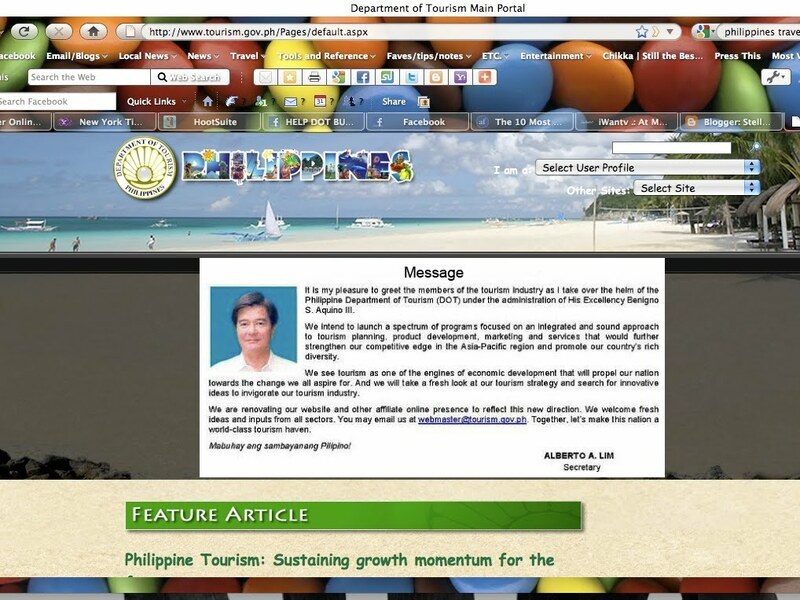 THOSE who were appalled at the "interim" web site the Department of Tourism put out in a rush on Nov. 15, now have a chance to help in cleaning it up and providing original content to the new one that will be set up. According to this Facebook note from DOT Usec. for Plannning and Promotions Enteng Romano, all you have to do is email the agency's tourism information officer, Evelyn Macayayong at this address: eamacayayong@tourism.gov.ph "and express your desire to volunteer." The rest of the steps are there. My own suggestion to DOT Sec. 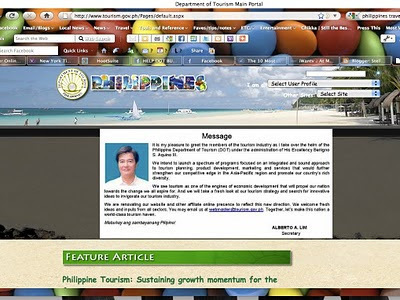 Alberto Lim is that perhaps we could just keep the old "www.tourism.gov.ph" address because when a traveler googles about a country he wants to visit, what are the first words he uses? It's usually "tourism" and "the country's name". When you put "Philippines tourism" or "Philippines travel", DOT's current web site pops up. If it isn't the first on the search results list, it's the fifth or sixth result. All DOT has to do, is to spruce it up - remove that photo and brief remarks of Sec. Lim, no offense, then put all the great touristy photos it has in its file, and of course, serve up well-written stories. I am actually thinking of contributing some of my past travel stories which they can use to point to major destinations. My own beef w/ the current web site is it asks for passwords when you want to get more tourism statistics. If you are like me, who works for a business paper, statistics count a lot in our stories. And we can hardly complete our pieces, unless we have updated data onhand. So I've requested travel blogger Ivan Henares - who has already personally volunteered to help DOT fill up content on its new web site – to kindly remind the DOT execs to update their official data periodically. While many of us are disappointed with the decision of the DOT about the choice of its new marketing slogan "Pilipinas Kay Ganda", I appreciate Romano's owning up to his mistake re: the choice of the URL and apologizing for it. I find that he is more open to criticism, unlike other DOT execs, which I think is the key in helping the agency move forward from this bungling. Let's just all be reminded by that age-old adage: "Haste makes waste." 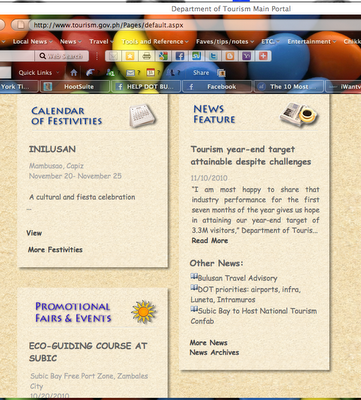 I am responsible for the choice of www.beautifulpilipinas.com. We were about to give a preview of “Pilipinas Kay Ganda” as the tourism country brand, and I was looking for an appropriate URL that would be associated with the new brand. I searched and looked at all possible permutations of “beautiful”, “philippines”, “pilipinas”, “is beautiful”, and this was the best name that was still available. Oh and btw, if you are tourism stakeholder – a hotel owner, marketing or sales person, general manager of a tourism establishment, travel agency owner, etc. - pls. don't hide behind your Facebook account and just keep on criticizing the DOT. Why not get together w/ your own colleagues, write down your concerns, and actually present these to Sec. Lim or U/Sec. Romano? I love my friends in the tourism industry, but I wish that sometimes, you would really put your money where your mouth is. Stop hiding behind anonymous comments on blogs; just come right out and say what you mean and stick your name on it. After all, you are the guys who are most affected by all these changes in the DOT marketing campaign. Maybe it's time you speak up publicly or bring your concerns directly to the DOT leadership.